On December 2nd 2015 Syed Farooq Malik, a young American of Pakistani origin (born in Illinois) was attending his workplace holiday party in San Bernadino. 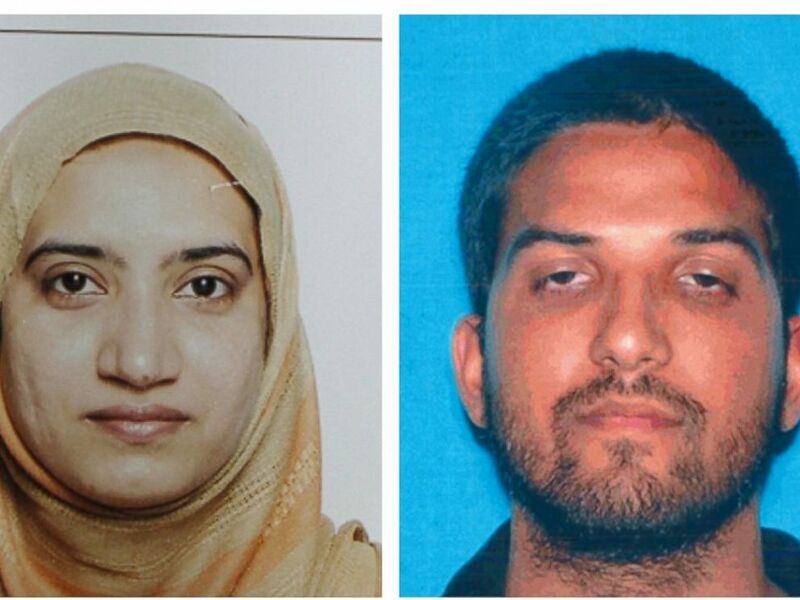 He left the party early (it is not clear if there was an argument of some sort before he left) and then returned with his wife, Pakistani-American Tashfeen Malik, and the couple opened fire on his coworkers and left after 4 minutes. 14 people were killed, 21 injured. It has since emerged that the couple had 2 assault rifles, thousands of rounds of ammo and several pipe bombs. They had also rented a Ford Expedition SUV a few days before the attack and used it for the attack as well as in the subsequent chase and confrontation with the police. Though they managed to escape the scene of the crime, they were eventually shot dead after an exchange of fire with the police. They had left their 6 month old baby girl with her grandmother on the morning of the attack. Sometime after the shooting, Tashfeen Malik also reportedly posted a “pledge of allegiance to ISIS” on her facebook page. It has since emerged that Farooq Malik had a "normally religious" upbringing but had become “more religious” in the last two years. According to his (estranged) dad, he was obsessed with Israel and “shared the ideology of ISIS leader Abu Bakr al-Baghdadi”. And it seems that his wife was brought up in far more Islamist fashion than he was. Her father is a Pakistani who works in Saudi Arabia and supposedly became “more religious” there. 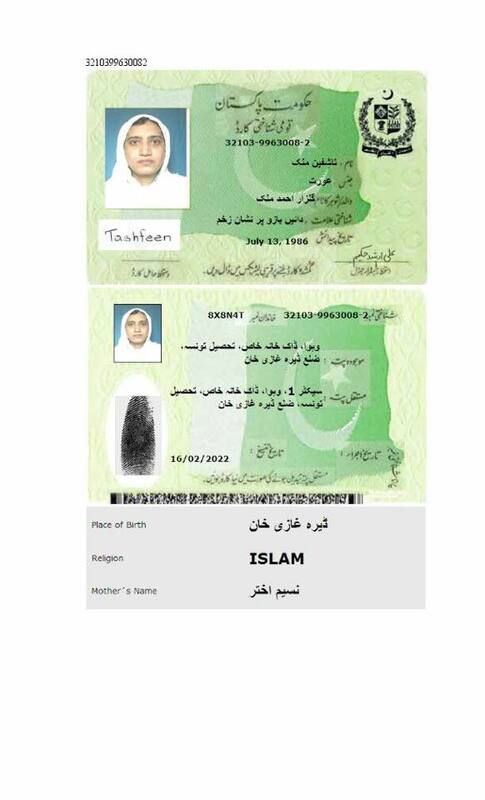 She lived in both Pakistan and Saudi Arabia and was a full-time niqabi when she attended Bahauddin Zakariya University’s pharmacy department. After marriage, she did not show her face even to her father-in-law and her brother-in-law and stayed in seclusion in her California apartment. She did not attend the baby shower thrown by her husband’s coworkers (the same people the couple later went to shoot) and it is very likely that she was more “radical” than her husband. It seems likely that the two of them decided to kill people because they wanted to strike a blow for their version of Islam, but the actual choice of target (i.e. where a group of people would be murdered) may still have involved some “workplace grievance” (though no convincing grievance has yet been revealed). Reaction to the shooting has included some predictable themes: Left-liberal Americans have tended to focus on the gun control aspect and some (but not all) of them have downplayed the religious element (or at least made the reasonable point that whatever the motivation for this particular shooting, the high death toll was facilitated by the easy availability of assault weapons in the United States). They are also pointing out that Muslims commit a vanishingly tiny percentage of mass shootings in the US and victims of “gun-violence” far outnumber the number of people killed in terrorist incidents., etc. etc. Right wingers meanwhile have focused completely on the Jihadi terrorism aspect and deny that gun laws or the cowboy “pro-gun” culture of the United States had ANY connection with the event. The usual suspects think Obama is “coming for our guns” and is failing to take action against Muslim hordes bent on migrating to America to blow it up. The short answer is “both”. I have no doubt that Jihad was a major (in fact, primary) motive in this case, but easy availability of guns surely helped. 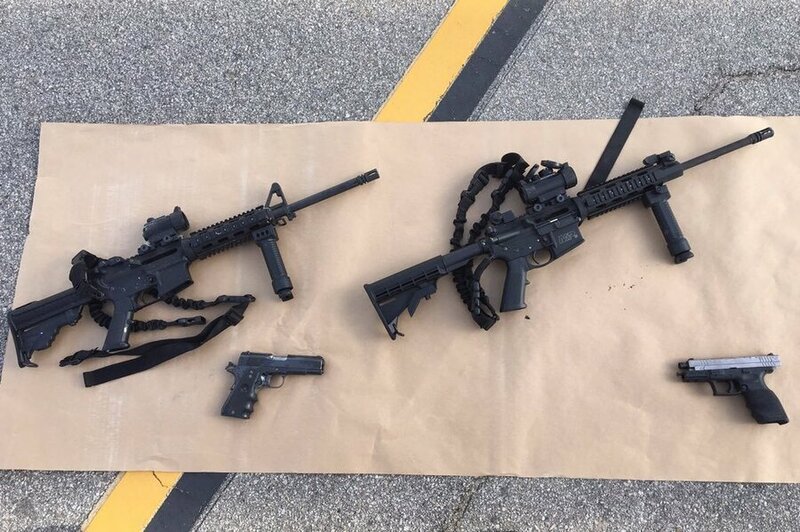 It is likely that a “self-starting” jihadist in a less “gun-friendly” society may have had some difficulty obtaining 2 assault rifles and thousands of rounds of ammunition. I emphasize “self-starting” because (as the Paris terrorist attack makes clear), organized terrorist groups (and organized criminals in general) can obtain very impressive arsenals even in Europe, where gun-control is much stricter than it is in America. Mass shootings in America are mostly “Black on Black gang violence” (and so occur below the radar of Americans who live outside the specific neighborhoods where such crime is commonplace. Most liberals only notice them only when they tote up the figures for "355 mass shootings in America this year"), but those that do make headlines tend to the ones where more peaceful parts of the country are targeted by some shooter. Most of these are carried out by loners (some motivated by right-wing militia type propaganda, most just motivated by personal slights and paranoia, etc.) and it is possible that similar loners in other countries may have some difficulty doing the same amount of damage (Brevik in Norway being the obvious HUGE exception). A few have been carried out by Muslims undergoing “spontaneous Jihad syndrome” (e.g. Fort Hood, Chattanooga) and it is possible that more gun-control may damp down the number of casualties caused by such attackers. Certainly the London subway stabber could have killed more people if he had a gun, but then again, he may just have been a very incompetent person. Muslims in China have managed to kill up to 170 people using nothing more sophisticated than cleavers and knives. So a more detailed look does suggest that more gun-control may have made the shootings less deadly, but not necessarily. In the short term, gun-control has very little to offer. But in the long term it may still be significant. Not because it will make guns disappear (it is almost impossible to imagine that in a country with 300 million guns and porous borders), but because its enaction would itself indicate a significant shift in America’s gun-happy culture. Countries like Canada are not gun-free, but they do have a culture that does not glorify loners with guns and personal violence in the way American culture frequently does. But this seems more significant if one has not yet corrected our second misconception. See next. This one is obviously NOT true. 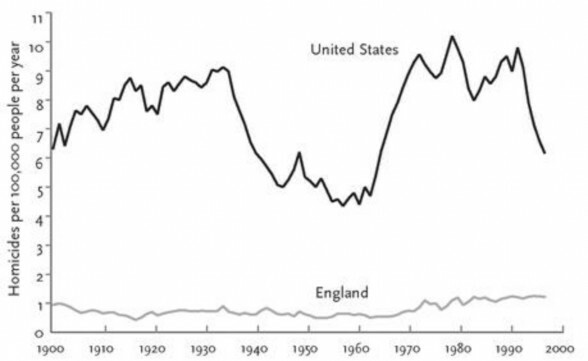 Violent crime in the US has been dropping steadily for decades and is very far below its 1970s peak (a time no doubt remembered as the “good old days” by many people J). There are specific areas (mostly inner cities) where violence is indeed horrifyingly endemic and affects practically all citizens on a daily basis, but outside of those areas, America is a relatively safe country (though this safety is associated with excessive police violence and truly horrendous incarceration policies). Even when taken as a whole (thus including the inner cities in the figures) the US is not as safe as Denmark or Japan (poster-boy for monoculturalism by the way), but it is not as violent as Mexico or Jamaica or even Russia and Lithuania! Especially of note, the crime rate in “safe neighborhoods” (a large proportion of American neighborhoods) is in the much idealized European, Canadian or Western European range. Media hype is a different matter. 1. Sunnis. These were the ones who thought the rising Arab empire was best led by the consensus of the elite. They had a tendency to rally around whoever had managed to fight his way to the top, provided he paid lip service to religion, patronized the rising ulama class and (most important) kept his eyes on the ball as far as managing and growing the empire was concerned. While Sunni clerics developed what seems to be a theory of politics (who is a just ruler? who has the right to rule? what do the people owe their ruler? etc.) on closer inspection it turns out to be pretty much divorced from actual politics. Rulers and their courts had more in common with past Roman, Persian and Central Asian traditions than anything specifically Islamic. Rulers usually grabbed power by force. Dynasties rose and fell with little concern for theological rules. No "Muslim church" acquired a tenth of the influence of the Roman Catholic church. This tradition is not ISIS-like in detail, but it also paid lip service to ISIS-like ideals that ISIS can and does fling in the face of "court clerics" who happily go along with whoever happens to be the ruler. Sunni tradition is not ISIS in practice, but it trains and teaches children using ideals that ISIS may aspire to more strongly than the Sunni rulers do themselves. This hypocrisy-crisis is a recurrent feature of modern Islamicate politics. And it is the reason why “moderate Muslims” (aka mainstream Sunnis) regularly fall prey to “Wahabism”. They are not falling prey to a new religion, they are falling prey to a more distilled and internally consistent version of what they have been taught as their own religion. 3. Khwarij. The Khwarij insisted that neither the elite, nor the family of the prophet had a special right to rule. Only the most pious, the most thoroughly "Islamic" person could do that. Muslims who committed major sins or failed to meet their standard of Islamic fervor were as much the enemy as any infidel. Even more so in fact. The Khwarij were always small in number and they were repeatedly defeated by both Shia and Sunni rulers, but their tendency has never completely gone away. Something within Islamic tradition keeps them alive. Mainstream Sunnis may pay only lip service to Jihad and the harshest punishments of shariah law (particularly in modern times), but these ideals are present in their theology. And ideals can effect some people. True believers arise, and in times of anarchy and state collapse, they may be the lowest common denominator, providing a framework around which the asabiya of Islam can cohere and in which the community can see hope for a return to a commonly-imagined (though mostly imaginary) golden age. Groups like the Wahabis, Lashkar e Tayaba, the Taliban and ISIS are simply combining the waters of 1 and 3, usually with more 3 than 1. But they are NOT relying on some new ideology invented out of whole cloth by Wahab or some other evil Saudi. They are (in their own mind and in the mind of many idealistic Muslims) simply purifying actually existing Sunnism. Just as an aside: What about Sufism? In many cases Sufis can simply be described as mainstream Sunnis with mystical or humanistic instincts; trying to get the most good out of religion while leaving out most of the imperialist and legalistic baggage. In some cases, they may be more akin to a secret society (like the Freemasons), influencing much from behind the scenes, but by definition, it is not really easy to disentangle myth (and self-promotion) from shadowy reality in this scenario. In other cases, they may think of themselves as the perennial philosophy, operating within Islam as it operates in all true religions. And in some cases, they are hardline Sunni Jihadists with a “master and novice” framework added to it, rallying the troops for holy war and conversion of the infidels. Take your pick. But do remember that Sufism is not really a sect with any single reasonably well-defined theology. Second, and equally important: the Saudi Royal family is not the source of religious ideology in Saudi Arabia. They allied with this religious movement to gain power, but at crucial points, they have been willing to go against the wishes of their Wahabi base. It is the people of Najd (the wahabi heartland, so to speak) and specially their religious scholars, who are the real fanatics in Saudi Arabia. A democratic Saudi Arabia would likely be more Wahabist than the royal family. Incidentally the main oil reserves are located in the (relatively small) Shia region of Saudi Arabia. This region became part of Saudi Arabia by conquest (not by imperialist manipulation or “Sykes-Picot”; Brown people have agency, their leaders can conquer people too). American companies (invited in by Al Saud because he, quite rationally, feared the British imperialists more) found oil there. Soon the world war accelerated oil demand and the US became an ally of the Saudi Royal family, which it remains to this day. For a long time, the US ignored and sometimes (most egregiously, in Afghanistan and Pakistan) actively encouraged the export of Jihadist Islam from Saudi Arabia. This was short-sighted and morally wrong, but it was based on a serious under-estimation of the potential of jihadism as an ideology, as well as a prioritization of anti-communism over good sense. Note that contrary to Eurocentric Left-wing propaganda, Saudi support for pan-Islamic causes was not primarily initiated by the US. It was the "push" of their own religious motivation plus the "pull" of demand for pan-Islamism in newly minted "Islamic" countries like Pakistan that drove most of this effort . In any case, I really do not see the US as actively encouraging this process after 9-11. The Saudi Royal family has also slowly (too slowly for most of us) moved away from unrestrained support for the most extreme international Jihadists, but continues to support many Islamic causes worldwide (not just Wahabi causes, but mainstream Sunni causes that it hopes to coopt) and continues to support “moderate Sunni Jihadis” in their regional war against Shia Iran and its allies. And of course, they continue to impose ISIS-like punishments (cutting off hands and feet, beheading etc) for crimes including the crime of apostasy (all of which are a standard part of mainstream Sunni Shariah, and that therefore have the theoretical, but not always the practical, approval of mainstream Sunnis). This causes many liberals in the West (and elsewhere) to insist that the US should break its alliance with Saudi Arabia and even bomb them. But what happens then? Will they become less jihadist or more? And who gets the oil? Iran? Russia? China? The point is this: there is a quick and direct way to weaken Saudi power and the hardline shariah-based Islam they encourage, but it requires taking the oil away from them (since oil wealth is the source of their power). This can be done. The local population is historically Shia. Maybe Iran can capture the oilfields and set up a Shia-client state and defend it against Saudi attack? Or Russia Or China can do this job? Or the US can do it itself; but such a grab would be a naked imperialist military intervention, and it would surely require shooting any Wahabi who shows up in the oil-region. There is no pretty way to do it. If the US just breaks off relations, the Saudis will look for a new protector. Pakistan, China, maybe even Russia could be tempted. But Jihadism does not come solely (or now, even mostly) from the US alliance, and will not go away if that alliance breaks. It likely can be moderated if the Royal family is pressured, but it will be moderated against the wishes of the people of Saudi Arabia, not on their behalf. And it will be moderated by an authoritarian regime willing to use torture and violence to impose its will on a hardline Islamic population (at least in the Najdi heartland). If all this is not clear, then the appeals to “break off our alliance” are just liberal posturing and virtue-signaling, not real policy. By the way, any such invasion and occupation to impose liberalism and good 21st century behavior would also invite the ire of all pro-Shariah-true-believer Sunnis in the world. Prepare for that too. Otherwise, the Royal family is the best bet in Saudi Arabia and that is simply the ugly unpalatable truth. D. Any Muslim can become radicalized and fall victim to spontaneous jihad syndrome at any time. Modeling ISIS chances in your country..